The bald eagle is 30 to 31 inches in length and weighs 8 to 14 pounds. An eagle's wingspan is 6 to 7 feet. Adults (5-6 years) have a white head and white tail. Its distinguishing feature is its orange/yellow very deep and arched bill. The rest of the body is blackish. They have yellow feet with sharp black talons. Females are larger than males. Young birds lack the white head and tail, but have a larger wingspan and longer tail than do mature birds. The voice is squeaky cackling. Migratory routes are chosen to take advantage of thermals, updrafts and food sources. Eagles congregate in winter to hunt and roost. Within a roost a hierarchy develops, the oldest and most aggressive eagles occupying the highest perches. Eagles hunt by swooping either from flight or perch, or while wading from shore, grabbing prey with either the bill or talons. Bald is a synonym for white, not hairless, in this case. 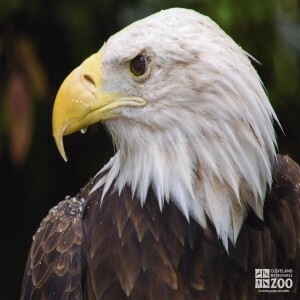 The bald eagle has been declared endangered in 43 states and threatened in another 5. Only Alaska and Florida have sizable populations. Bald Eagles inhabit areas around lakes, rivers, marshes and seacoasts. Migratory routes are chosen by the bald eagle to take advantage of thermals, updrafts and food sources. Bald eagles congregate in winter to hunt and roost. Within a roost a hierarchy develops, the oldest and most aggressive eagles occupying the highest perches. Winter roosting sites are usually among tall conifers that are protected from prevailing winds. Eagles hunt by swooping either from flight or perch, or while wading from shore, grabbing prey with either the bill or talons. They may sit for hours at a vantage point over shallow water, waiting for a fish to rise. They swoop to grab it, barely getting their feet wet. They will also attack diving birds. Fish or birds that are too heavy are towed to shore over the water's surface. Breeding bald eagles are territorial, defending the nest area from intrusion by other bald eagles. They prefer to build nests in the crotch of trees sheltered from the elements. Breeding occurs after maturity, at 4 to 6 years.They mate for life and will use the same nest each year. Tree-top nests are built of sticks, hay, moss and sod. They may weigh as much as 1000 pounds and be 4-8 feet in diameter. Eagles attain sexual maturity at 5 years. While both sexes participate in incubation, the female takes the larger share during the day. The young stay in the nest for about 10-12 weeks.